Bring the beauty of nature into your home with this lifelike 31” artificial rubber plant. Its beautifully arranged lush green leaves lay elegantly over the classic decorative planter. 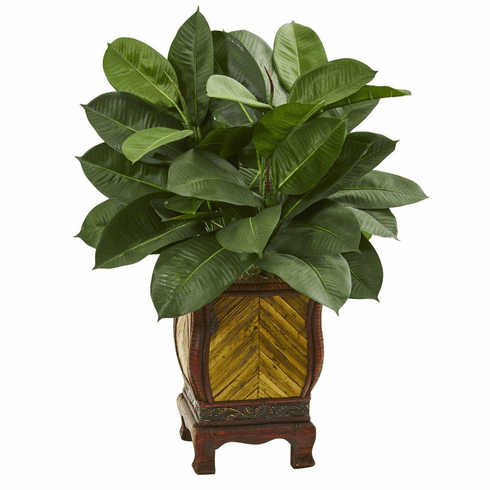 The vibrant color of this artificial plant will accentuate any mahogany furniture in a dining or living room. Or, you can use its wonderful greenery to enhance the appearance of your breakfast nook's table. Surround it with silverware and napkins. Height: 31 In., Width: 23 In., Depth: 23 In., Color: , Pot Size: H: 12 In. W: 9 In. D: 9 In.